March is still with us and I'm honoring Academy Award winners (and nominees) by discussing their connection with Christmas TV programming. 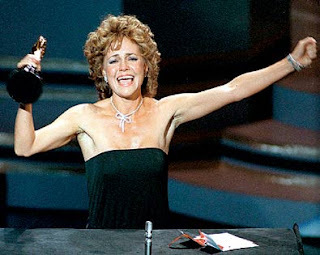 Actress Sally Field has won two Oscars for Best Actress--in 1979's Norma Rae and 1984's Places in the Heart. Before she appeared in the Oscar-winning role of the union supporter, Field starred in a made-for-TV movie that takes place at Christmas entitled Home for the Holidays. This 1972 horror/thriller is directed by John Llewelyn Moxey and executive produced by Aaron Spelling. If you ever thought your family was trouble at Christmas...here, four sisters return home after many years absence when it is believed that their step-mother is poisoning their father. It had been rumored that their step-mother Elizabeth (played by Julie Harris) had poisoned her first husband and now their father (Walter Brennan) believes that Elizabeth is killing him too. Though the sisters despise Elizabeth, the claim seems too outrageous to believe until one by one each of the sisters dies or disappears. The true horror of this story to me is that actress Julie Harris, just 17 years prior, had been playing the romantic lead to James Dean (in 1955's East of Eden) and now is partnered with the aged, crotchety Walter Brennan. But Sally Field plays the youngest sister Christine--she's the screamer! Speaking of Places in the Heart, the captivating child actress Gennie James that plays the role of Possum Spalding in that film can be seen in two Christmas-themed movies, A Smoky Mountain Christmas and with a larger role in The Christmas Gift. Both movies are from 1986. Home for the Holidays rocks. I love the end. Moxey kind of repeated this formula (twist and all) with No Place to Hide (not Christmas themed, but scary!)... I thought Jessica Walter was the real standout in this movie. She's awesome when she's drunk! Yeah, Jessica Walter is fantastic. I like her drunk all the time on 'Arrested Development' too.